Time management is a tricky beast. Given we can only remember three or four things at a given time, it’s no wonder that when we need to juggle work projects, social dates, family time, and picking up the groceries, some to-dos are constantly being postponed. There’s no shortage of apps that promise to help you streamline and organize all the tasks on your plate, whether your main aim is to stay focused or work towards long-term goals. But there’s a catch: any effective to-do app hinges on your diligence at typing in your tasks, as well as your ability to break down larger projects into doable goals. In hunting down the best to-do apps, we looked at task management features, general organization, and any collaborative features. Most important of all, we chose these apps for how easy it was to enter new tasks and set deadlines. 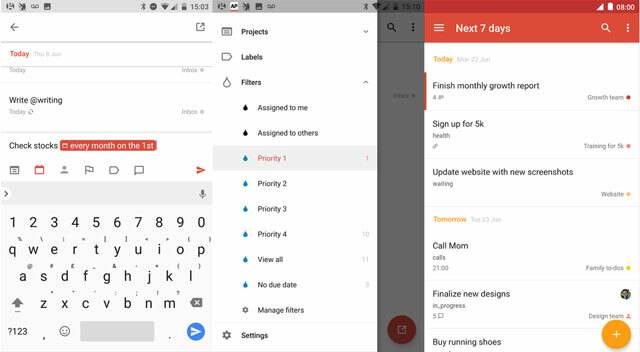 At its basic, free level, Todoist is a powerful task manager, with numerous ways to sort and label your to-dos, be they in the realm of work, home, or errands. It’s fast and slick to type in a to-do that’s sent straight to the Inbox view; you can later add more details such as deadline, priority level, or a “parent” task – if a chore is part of a bigger task. The app recognizes natural language, so you can type items such as “Meet Liz at 1 PM Monday” or “Check stocks every month on the 1st” to instantly set these up as due dates. You can get a handle on your day or week ahead in the Today and Next 7 Days views, where all due tasks are displayed in a minimal agenda design. Or, you can check by four priority levels what’s most urgent. Another way to organize what you need to do is as part of a “project,” where you can create sub-goals for larger, long-term goals. Setting deadlines for these then moves them into your daily or weekly views to keep them top of mind. 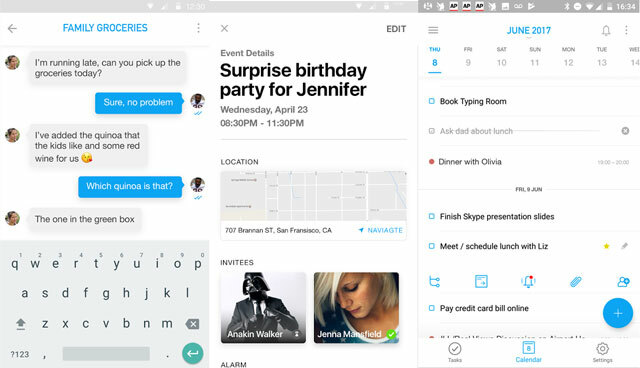 One surprising omission from the free version is reminders, which might make this app less suitable if you need some prompting for your to-dos. If you want to use Todoit as a collaborative project tool, however, you’ll need the Premium version anyway, which allows labels (which helps for sorting through numerous tasks), comments and file uploads on tasks, as well as an activity log, to show which team member has done what. Reminders are a full-bodied feature, working based on time as well as location, and whether you’re leaving or arriving. Google’s deceptively simple memo app is packed with some powerful features. The note interface easily morphs between a space for text memos, finger drawings or audio recordings (of that brilliant 3 AM idea! ), and a checkbox interface for tasks or grocery lists. You can also upload photos – and even more handily, Keep can read any text in the image, say of the back of a book, and convert it into digital text. Whatever type of note you make, you can add a time or location-based reminder. Using a reminder on a note is a decent workaround for creating deadlines for your tasks – just about the only feature this scrappy little app is missing. Reminders pop on your phone, as well as in Gmail’s Inbox view, and the Google Now feed. Each note can be sent via other messaging apps on your phone, copied to Google Docs, or shared with another Keep user who can then make changes to the note. Though there’s no feature for grouping notes by lists, you can color-code notes for an easy visual reference, or add labels, which helps when searching for hastily typed memos later. You can view your notes as a jumble of virtual Post-its or view only the ones you’ve tagged with a reminder. Naturally, Google also backs Keep with a smart search that sorts your notes into categories such as Books, Travel, Food, and Music. If you’re serious about task-managing – and punctilious about entering every little to-do – Any.do can be a major help to organize your day. A day-planning feature called Any.do Moment pops up each morning to encourage you to sort out every task still open – you can set deadlines for the current day or for later, or delete them or mark them done. Free users only have five of these per month; Premium users get unlimited uses. The free version has a pretty hefty lineup of features: Tasks can be added with a tap, with several suggested actions (such as Ask, Buy, Schedule) and items (such as “Ask about insurance”) – all the better to speed-type that monolithic list of to-dos. You can sort tasks into lists, for particular projects, say, or keep your grocery needs in one place. You can also set up daily/weekly/monthly/yearly tasks. 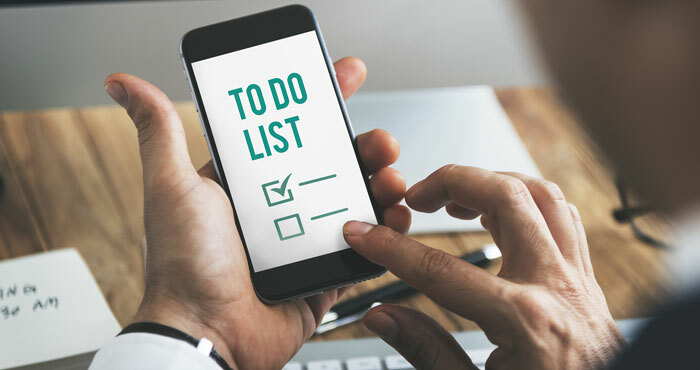 Syncing your calendar lets you see how your task deadlines fit in with other appointments, and interestingly, after every phone call, Any.do pops up a message to ask if there’s any task you need to schedule as a result of the call. Each task can be elaborated upon with text, audio, video or image notes (limited to 1.5MB per file for free users) and set to come with a time reminder. Any.do is highly useful in its free incarnation, but a premium account is probably necessary if you often collaborate on work projects (or for power users). There’s task sharing to delegate to-do’s (the free version only allows one shared task); the ability for list members to comment on tasks; as well as location-based reminders so you can stop forgetting that one thing every time you pass the convenience store. Can checking off tasks be a game? Sure, that sounds like something you’d Tom Sawyer your kids with, but Habitica makes a pretty good feint at it, cloaking lists of tasks in an RPG where your dot-matrix avatar can pick up Health, Experience, and coins for completing to-dos. 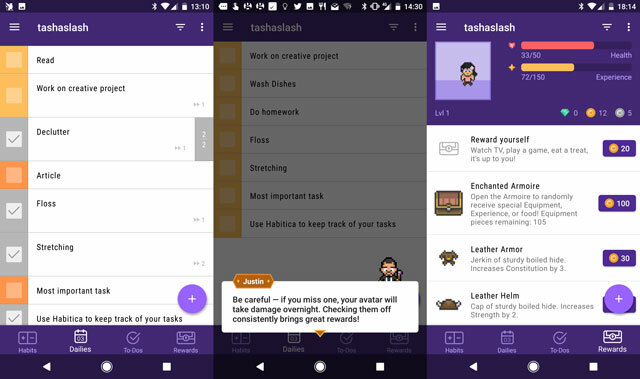 Where most to-do apps help turn you into a lean, mean productivity machine, Habitica instead aims to help you build better work (or personal) habits. Hence, the categorization of tasks into To-dos, Dailies (recurring tasks), and Habits, where you put down ways you might improve yourself, for example, “10 minutes cardio”, or “Don’t bite fingernails.” As with tasks, each time you tap a habit to indicate that you did (or didn’t) execute said habit, it adds (or detracts) points from your character. Points or coin can be used to level up – a surprisingly addictive thrill – or exchange for in-app weapons and armor that add to your character’s attributes. Habitica isn’t the app with the slickest interface or most powerful features – for example, you can’t share tasks or prioritize them (they display in order of due date) – but it does put a fun spin on getting productive. And that could be the game-changer. Editor’s note: One of our long-time favorites in this category is Wunderlist, but Microsoft acquired it two years ago and recently announced it would shut down the app at some point, so we can’t in good faith recommend starting to use it now. Why would they acquire it, then shut it down? Thank you for the great list Natasha. I started using Hitask lately and it’s going pretty great right now. Would recommend you to check it out too. Nice list, thanks! I also use a tool called Deskun right now, it allows creating todo lists in Gmail. Its a task list for people who cant remember routine daily stuff like locking the front door so have to come back to double-check it. your lists would be always ready to refill, based on current time, and with comfortablescreen for checking tasks one by one. Paranoiacs like myself can also use build in photo feature to make sure everything is completed. Hopefully it would help someone else, google play doesn’t give love to new aps. I use the iSmart.Life application to plan my tasks and projects and monitor their implementation. This is a very simple and convenient application. The application has many useful features: notes, projects, budgets, reports, etc. You are right, time management is a talent and skill that’s really important both for personal and work struggle. Keeping my productivity high as much as possible is something that I have trouble with almost daily, back when I haven’t discovered to-do lists yet. 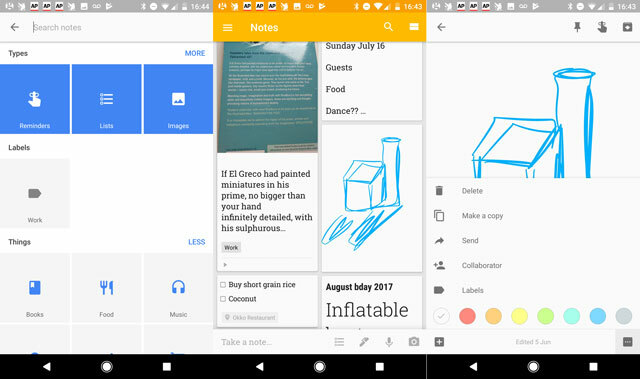 I use Wunderlist right now but I am also actually investigating Google Keep because I find its UI very handsome and colorful, and hey, it’s Google. I think all their products are really great. I would also like to recommend this checklist app list here: https://www.process.st/checklist-app/. It’s got one of our favorites, the Process Street. This one is what we use in terms of keeping our tasks within the company going smoothly. We just love creating checklist-based processes and workflows using this API and it has been really pivotal with regards to keeping our team productivity going.